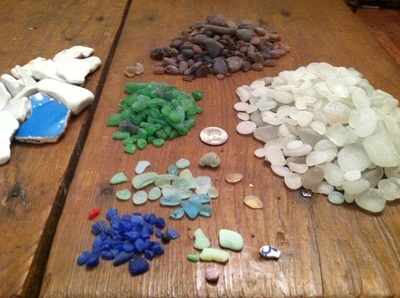 Where to Find Sea Glass - The question most collectors of sea glass ask is, "Where do I find it?" Where are the best beaches? Honestly? I'm still a beginner and am on a quest to explore the many beaches that populate our great Pacific Northwest. 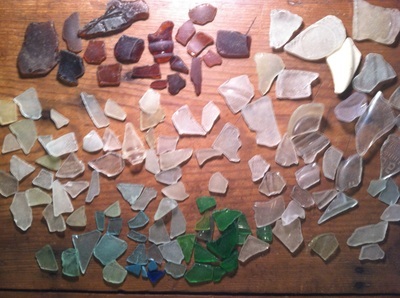 It may take me a few years but I would also like to find out where the best beaches are located for finding sea glass. So far, most of the beaches I've explored have limited to an abundant supply of sea glass. The variables of surf action and history of dumping all contribute to finding a great sea glass beach. 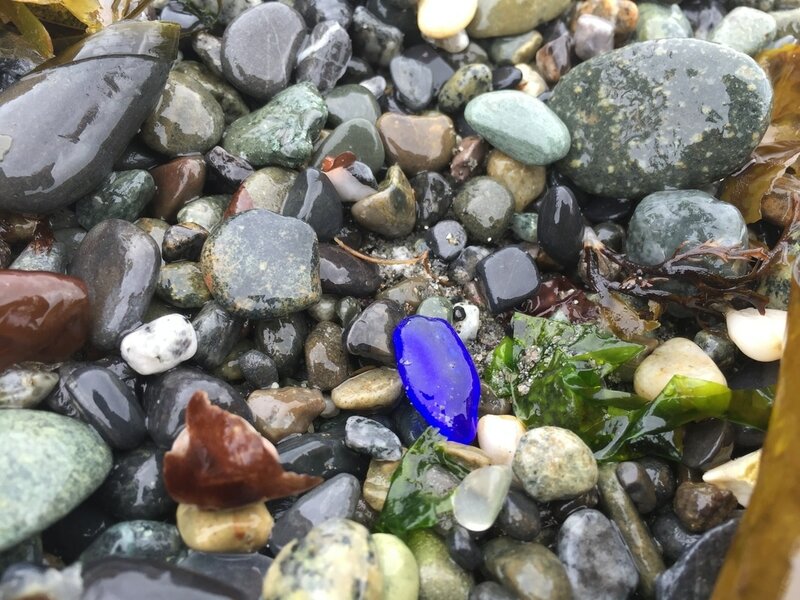 My conclusion for now is that Glass Beach in Port Townsend is the best location on the Olympic Peninsula and Washington coast to find sea glass. I've found some great collections here in Kitsap County but the best quantity and quality are on Glass Beach. Use the videos below to provide sea glass hunting tips and address tidal concerns for a great hike out to Glass Beach. I've also provided a gallery below that illustrates some of the sea glass that was found at various beaches. How is Sea Glass Created? 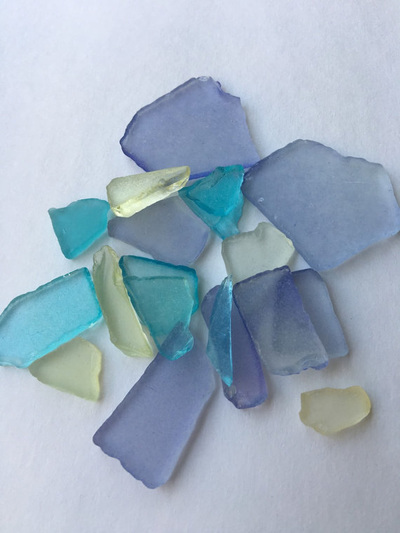 Sea Glass is a beautiful artifact that can be found almost everywhere on beaches where the surf has pounded and shaped glass fragments into shapes of art. Sea glass is a product of man and of God's creative power. 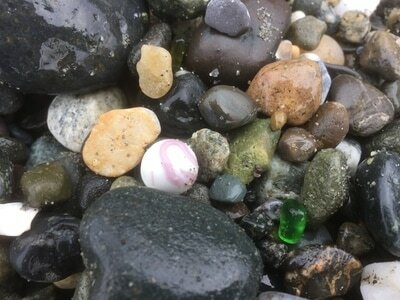 Bottles, jars, vintage car tail lights and anything glass thrown away in decades past are tumbled by the waves of the ocean to form beautiful gems of diverse colors. The more current or wave action, the more likely that you are to find smooth top quality sea glass. Higher water PH means that glass will age (become smoother) faster and the rockier and rougher the beach, the better sea glass will age. Sadly these gems of the sea are vanishing due to modern use of plastics and recycling efforts. Before the 1960s most everything used by consumers was sold or contained in glass bottles, jars or metal cans. Recycling was a concept of the future that just didn't happen. In coastal areas or more rural locations trash collection wasn't a common practice. It was even the civic practice by some towns to simply dump the local trash directly into the sea. This was certainly the easiest option for smaller coastal communities. 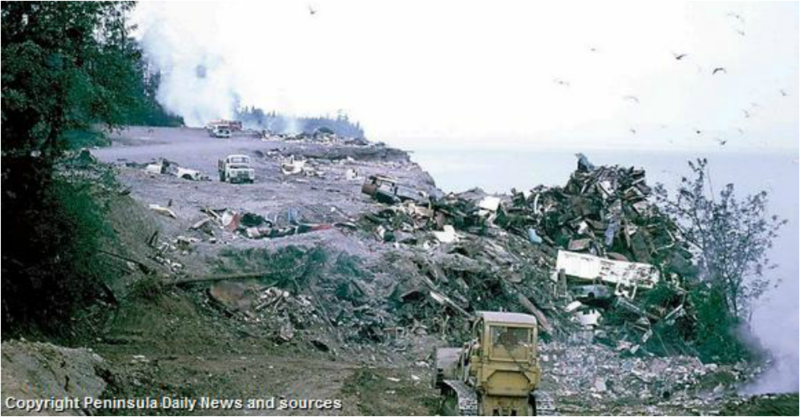 These past dumping grounds eventually became our treasured glass beaches known all over the world. 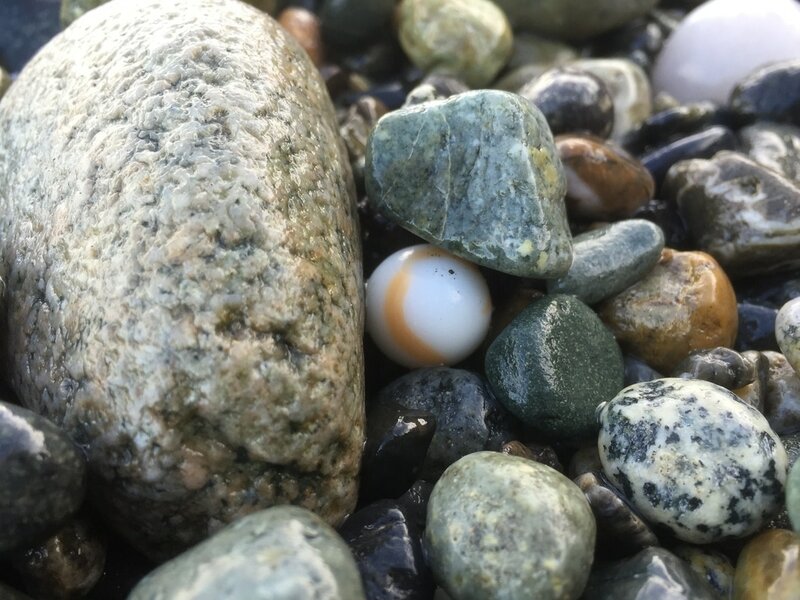 Even if a particular beach had no history of dumping, it is still very common to find glass in varying amounts on most beaches. The Fort Bragg, California area is one example and is now famous for it's multiple glass beaches. 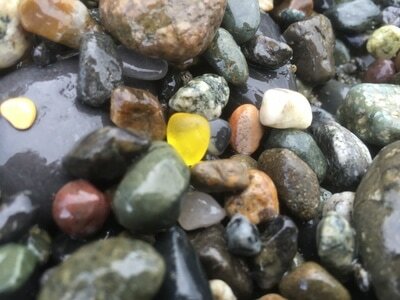 Glass beach #3 at Fort Bragg is now protected and lies within State Park territory. Sea glass begins as bottles and glass that get tossed on the shore, broken and then tumbled smooth into rounded shapes by the wave action on the beach. The wave and surf action function as a large rock tumbler recycling the pollution that was once discarded by past generations. 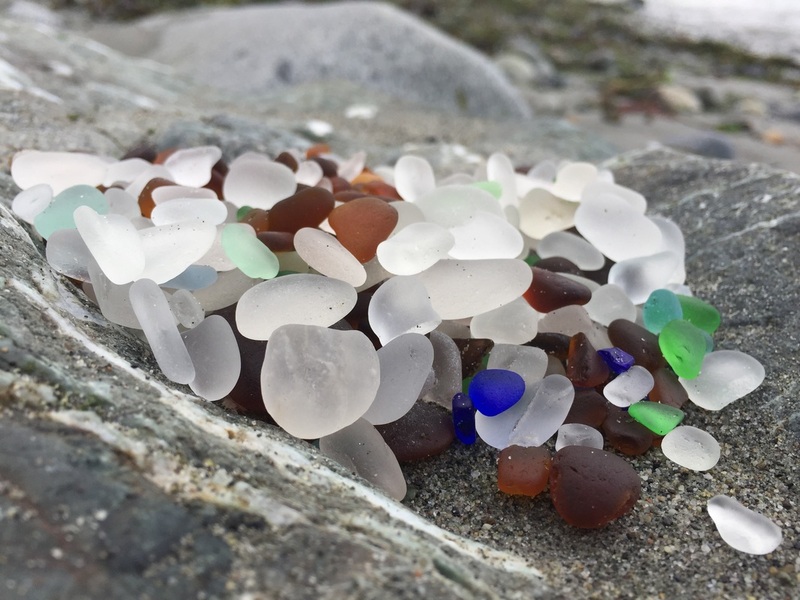 Sea glass may take ten to twenty years in the constant tumbling of the surf for glass shards to become "sea glass" that is gently rounded and frosted all around. A quality piece of sea glass has no shiny spots, is completely frosted and has smooth edges all over. 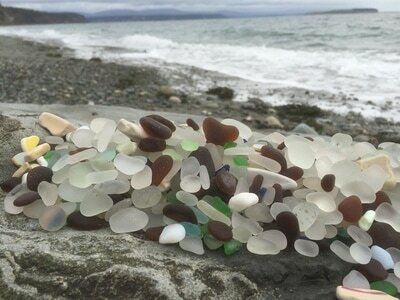 Once it has become "sea glass" with smooth frosted sides, that piece of glass may remain on the beach for decades slowly diminishing in size as the wave action of the beach continues to tumble it. 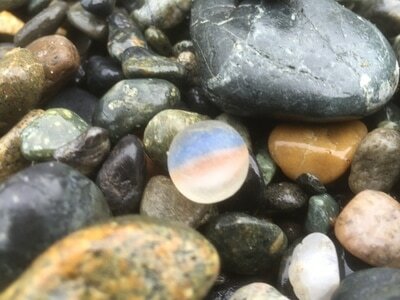 ​The frosting that covers the older sea glass is the most sought after quality that collectors seek. 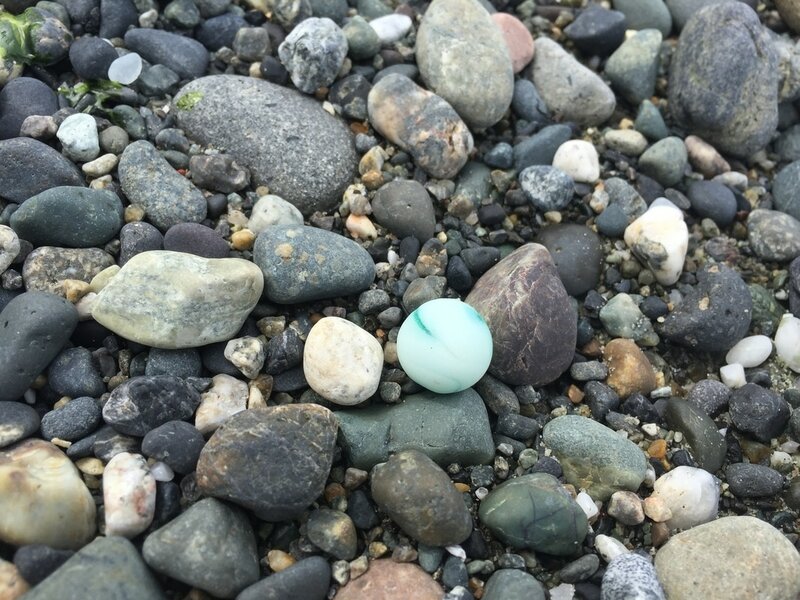 Frosting on a piece of sea glass can only occur in sea water and can not be replicated by artificial means. The saltwater itself plays an important chemical role in the development of frosting on a piece of sea glass. Glass is made from about 75 percent SILICA, or sand, 15 percent SODA and 10 percent LIME. Once exposed to saltwater, the glass undergoes a process of “hydration,” under which the soda and lime interact with the chemicals or higher PH level in the water, leaving that frosted or "pitted" surface craved by collectors. The pits or "frosting" are the result of a leaching process where the soda and lime are pulled out of the glass. The pits in the surface of the glass, give it a softened feel. The soda and lime also often react with minerals in the sea water, forming new mineral deposits on the surface that give the glass a "sparkling" appearance. There are many new attempts to create sea glass and sell it to the public craving more of the vanishing ocean gems. The sad reality is that many people are willing to compromise and purchase the faked glass in order to save money and to collect the rarer colors that are so difficult to find on the beach. 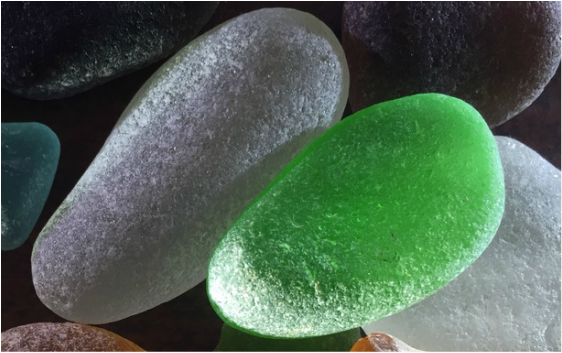 Some people attempt to sell their faked glass product as genuine sea glass and hope the ignorant public will not know the difference. Also, there are some web based businesses that openly advertise that their product as not genuine but attempt to sell their new product as being close to the real thing. They have discovered a technique that allows them to process the glass in such a way that produces a similar surface grain, frosting and rounding as that of genuine sea glass Jewelry Grade A. This process incorporates a cement mixer, sand, broken glass, salt, and water. I do appreciate their honesty but it still seems wrong to mass produce fake sea glass. So, the reality is for all sea glass lovers that the buyer must beware. 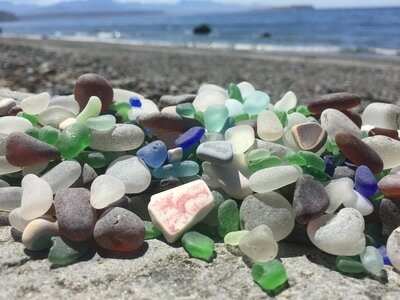 If you want genuine sea glass either find it yourself on the beach or buy it from reputable sources that guarantee their product as being real. 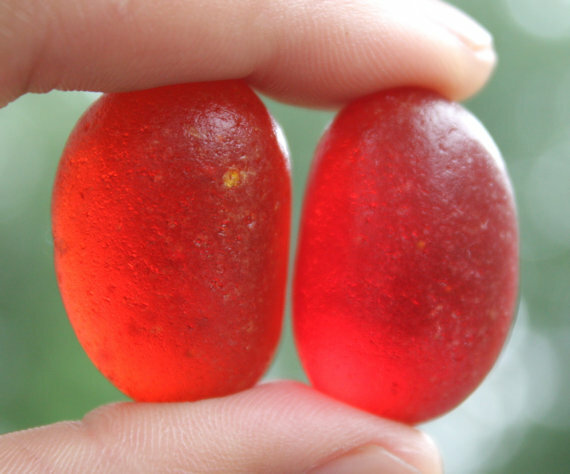 If you are willing to buy reproduced sea glass and your source is truthful about their product then it is your right. Real sea glass has certain qualities that can not be duplicated by any process. 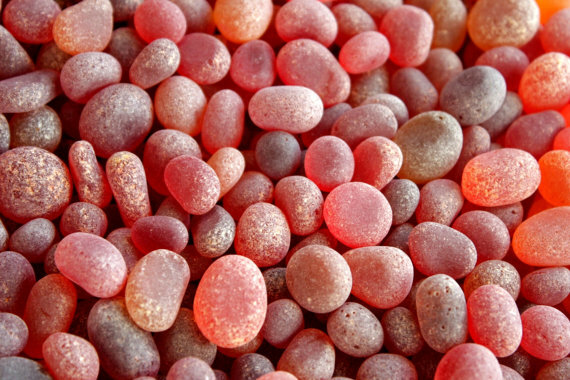 The gallery of faux sea glass pictures illustrated below are produced by a web based company. Each collection is sold for $2.00 to $4.00. So, you can see the affordability of fake sea glass if you are able to mass produce it and if there is a market for it. Please protect yourself if you are seeking genuine sea glass produced naturally by the ocean. It is important to us that collectors of sea glass, jewelry makers and the general public appreciate the quality of genuine sea glass. Thank you bytheseajewelry.com for your efforts to protect the legitimacy of genuine sea glass collectors. 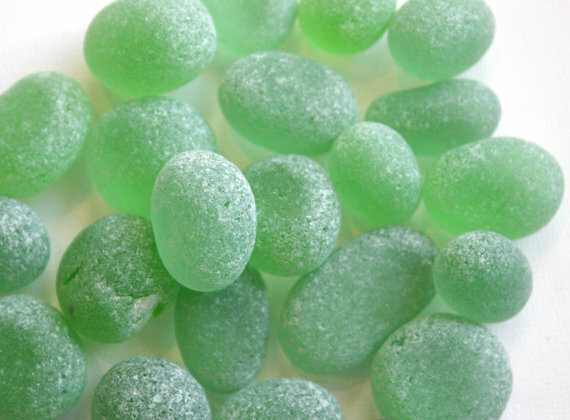 Other producers simply make their faux sea glass with less attention to the faked frosting effect. Their product appears rounded with a softened surface without the genuine frosting effect. 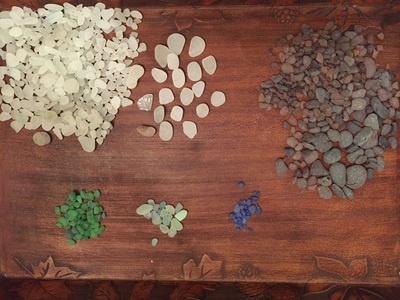 Some attempts at sea glass production also appear with a look of uniformity which is a by-product of mass tumbling in a large barrel or mixer. The beginning glass shards are cut out in mass thus producing uniformity in shapes. There is no uniformity on the beach. No piece is the same. No sand or natural sea grit rubbing against each glass shard is the same. No wave and tidal action is ever the same! The illustrations below are examples of attempts to produce sea glass with different methods of mass production. Notice one priority of faux producers is to create the rarer colors that are craved by collectors. Sea Glass is just not any piece of glass that is frosted. 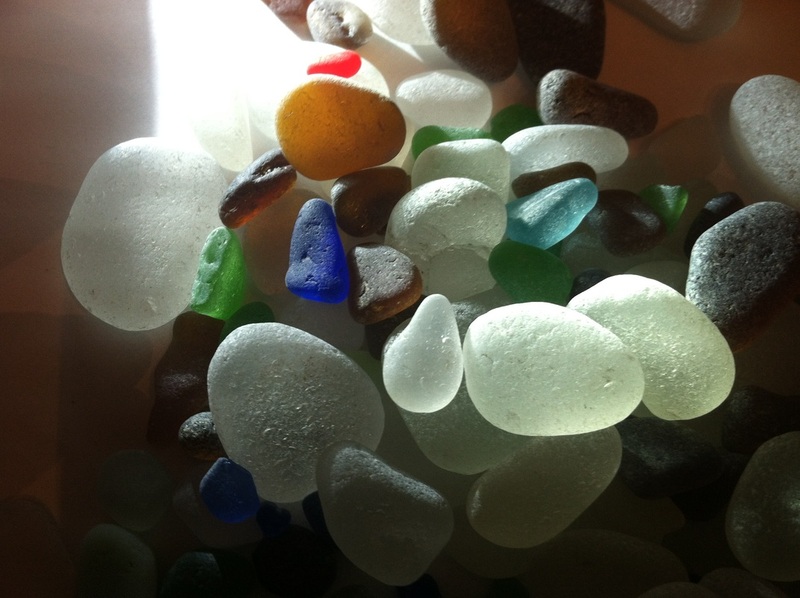 Real or Genuine sea glass is aged by the ocean surf over many years. Real sea glass is exposed to unpredictable amounts and sizes of rocks, sand particles, and wave action that pummel the beach throughout the seasons. Faux sea glass can not ever experience these variables and thus can not ever replicate the surface texturing that a genuine piece of sea glass manifests. Too Smooth - Many fake or faux sea glasses on the market can be distinguished by a very smooth appearance. Though sea glass texture or frosting varies from beach to beach, upon close inspection, you can always see some hydration of the glass. This is where the glass becomes "hydrated" or frosted as the sodium in the glass is replaced by hydrogen in the water. This is what produces the characteristic pitting and aging of the glass. 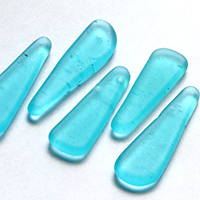 Many artificial sea glass products that are too smooth are made from acid etched modern glass. These come in the form of mass produced beads (prevalent on sites like Etsy and Ebay) and cut stained glass frosted in a tumbler. Too Rough - Glass that is too rough is usually glass that has been artificially weathered in a tumbler or cement mixer. Many craft supply companies offer this product for decorating, display and craft projects. Geometric Shapes - Genuine sea glass can have angular shapes (like triangles) and rectangular shapes (usually from broken window glass), if you see an assortment of sea glass that all has the SAME shape, it is probably a man made product purchased or mass produced in bulk for sale. 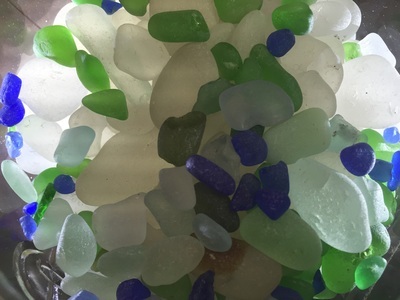 Though it IS possible to find real sea glass that has geometric shape with straight parallel sides or triangular, it would take hundreds of real sea glass pieces to find a matching piece with the same symmetry. It's just not probable. The reality is, as stated above, that the ocean beach provides a perfect lack of uniformity as the wave action, weather conditions, tides, rock and pebble conditions vary moment by moment and beach by beach. There can be no uniformity as you hunt for geometric shapes. Some people even hunt for heart shaped sea glass but the fact is no two pieces are ever alike. Every piece is wonderfully crafted and very unique! 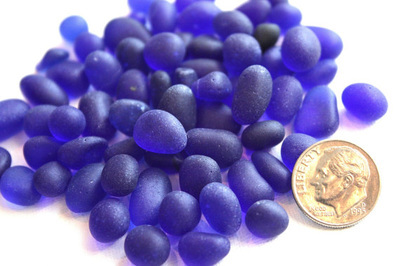 Rare Colors At A Low Price - Rare sea glass colors are exactly what they are, RARE! To see which colors are the rarest, see our "Color Rarity" section on this page. It provides a graphic that illustrates the different colors found from common to most rare. If you explore the web and find someone selling larger collections of blue, red, orange, pink, yellow or lavender etc. 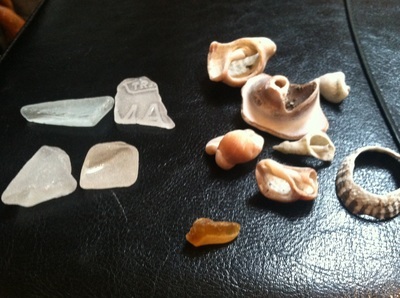 for very low prices, then you are probably looking at FAKE sea glass! Some sellers may disclose that their product is handmade, some will disclose this information deep in thier descriptions, some will not. Most sellers of Genuine or Authentic sea glass will let you know where their sea glass came from. Cost is the great determining factor. 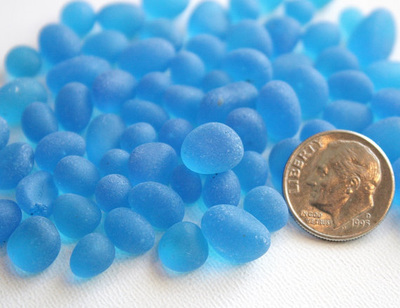 If you see a bag of blue or red sea glass for $6.00 and claiming it is real sea glass, it is not. Ask questions! If buying from a private seller, ask them if they personally collected the glass. Most disreputable dealers will dodge this question in a wide variety of ways from, "I bought it at an estate auction" to "we bought it at a flea market." Most real sea glass sellers will go out of their way to tell you about their collections and where they found their pieces. They will be proud of their work as they spent long hours hunting for their treasures. 2. Frost - upon removal from the water, crystalline formations or a frost can be seen on real sea glass. You can conceal the frost and magnify the color of your jewelry by rubbing a drop of oil into the surface. Frost is caused by years of exposure to water where the structure of the glass actually breaks down from salinity; hydroxide then leaches to the surface of the glass. It is NOT salt residue. Salinity of the water has a great effect on sea glass, it adds to the hydration process and therefore the quality of the glass. The texture in real sea glass is not achievable by artificial means. (Faux glass pieces can have tumbling residue but not have the true frost of genuine sea glass. Some fake sea glass pieces are achieved by tumbling and acid etching). Frost can sometimes be lost in the jewelry making process but can be brought back by cleaning with alcohol. Thickness - Shape, Color and Bubbles and additional features. Thickness and shape - Some real sea glass can be thin but the thicker it is the older it is likely to be and it's shape will sometimes have curvature (newer glass is much thinner than vintage glass and many fake sea glasses are made from colored flat rolled glass with no curve like from a real bottle or jar). Color, there are colors of sea glass that are no longer widely used or even manufactured today. Bubbles appear in some older sea glass pieces and are from the handmade glass process. Remember, while not all sea glass pieces have all of the listed features, most natural sea glass pieces have several of them! Are Beach Glass and Sea Glass the same? 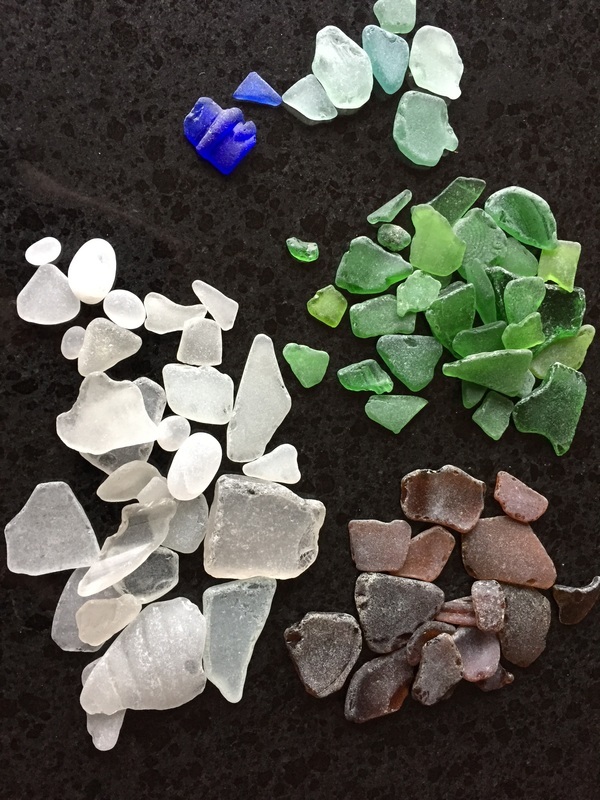 Sea glass is beach glass. - Beach glass is any kind of tumbled glass that is found on freshwater or saltwater shores whether it is on a river, lake or ocean beach. Beach glass may not be sea glass. Sea glass is found only on saltwater shores and can not be equated with beach glass found on river or lake beaches. Since most glass found on beaches comes from ocean beaches, we will continue to use the terms Beach Glass and Sea Glass interchangeably. ​Sea glass can be found in many locations and is typically found in various forms of condition after exposure to the surf. 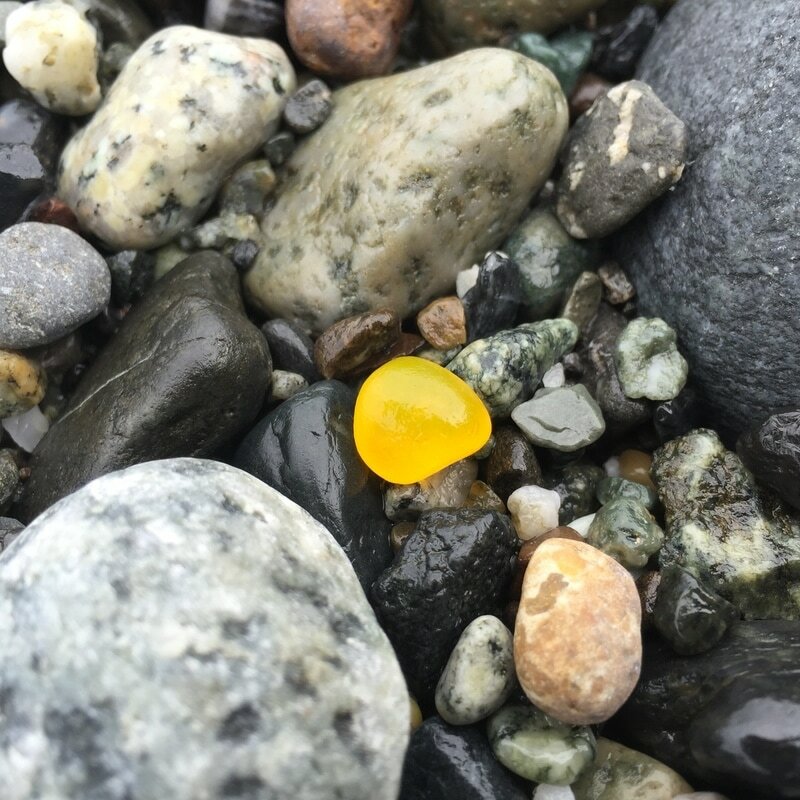 Simply finding a colorful piece of glass on a beach doesn't necessarily mean you have found a quality piece of sea glass. It might be a great piece for use in a craft project or for filling a mason jar on a shelf. It might not be on par, however, with what some call "jewelry quality." You could fill buckets with sea glass found on our local Puget Sound beaches but they wouldn't necessarily be high quality. Let's define what constitutes high quality "jewelry" grade and lower quality "craft" grade sea glass. 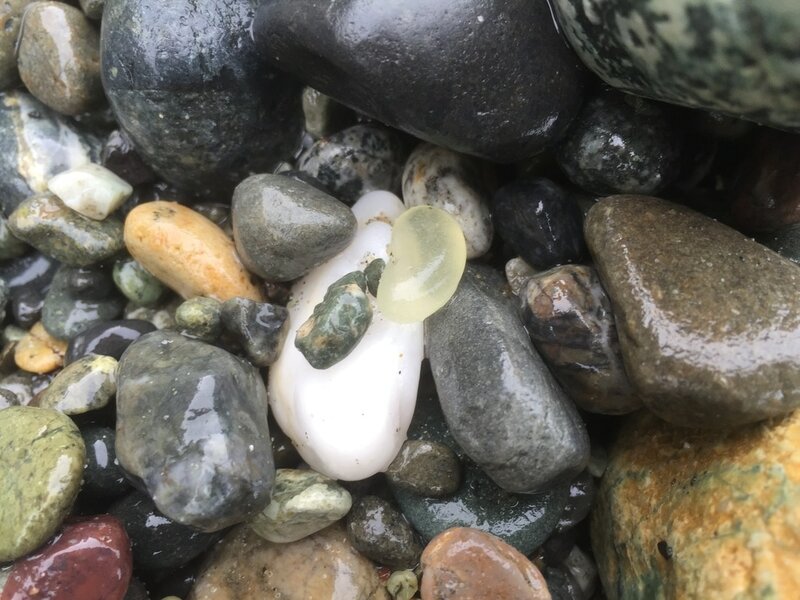 A piece of sea glass that is not very frosted or is chipped or broken can lower not only the condition of the piece but also the grade and perceived value of that beach gem. The highest grade quality of sea glass is Jewelry Grade. It takes many years for a glass shard to become a rounded and frosted jewelry grade piece of sea glass. Because of this, jewelry-grade glass is much rarer than craft grade. Most fine quality sea glass jewelry is made from Jewelry Grade A sea glass. Craft Grade may also be used for jewelry but most higher quality jewelry uses the higher grade sea glass. Evenly and thoroughly frosted with very rounded corners. No chips, poorly-rounded corners, or visible defects. Very good for jewelry and arts. because of unique shape, color, or other qualities, it could make a nice jewelry piece. not more than 1 rough or cracked edge. The progression from rough, sharp edged and clear sea glass to Jewelry Grade A sea glass is remarkable. 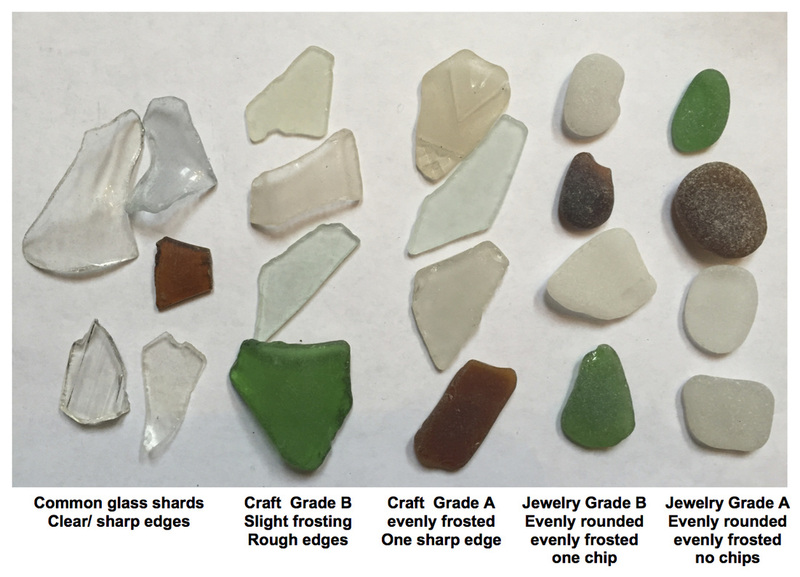 Use the visual graph below to help you explore for the type of sea glass you want. 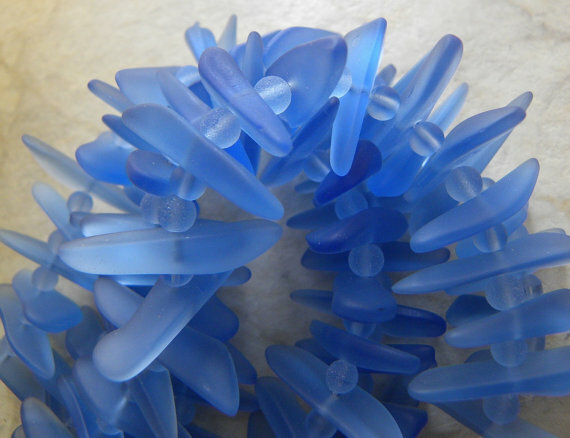 Various projects require different types of frosting and roundedness to make a good piece of Craft Grade Sea Glass or Jewelry Grade. Enjoy the hunt. It will get addicting as you realize the various qualities of glass that can be found on your favorite beaches. You will begin making plans to visit certain locations knowing the quality of sea glass that can be found there! 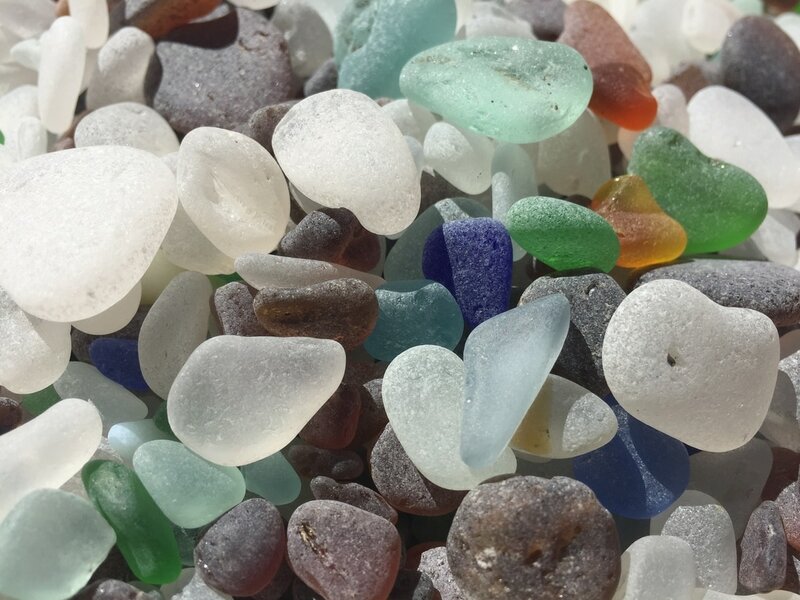 Sea Glass can be found in many different colors or shades. There are the more prominent colors (white, brown and various shades of green) that are found in abundance and there are more rare colors (aqua, cobalt blue, red, yellow and orange) that are valued as rare and very rare. 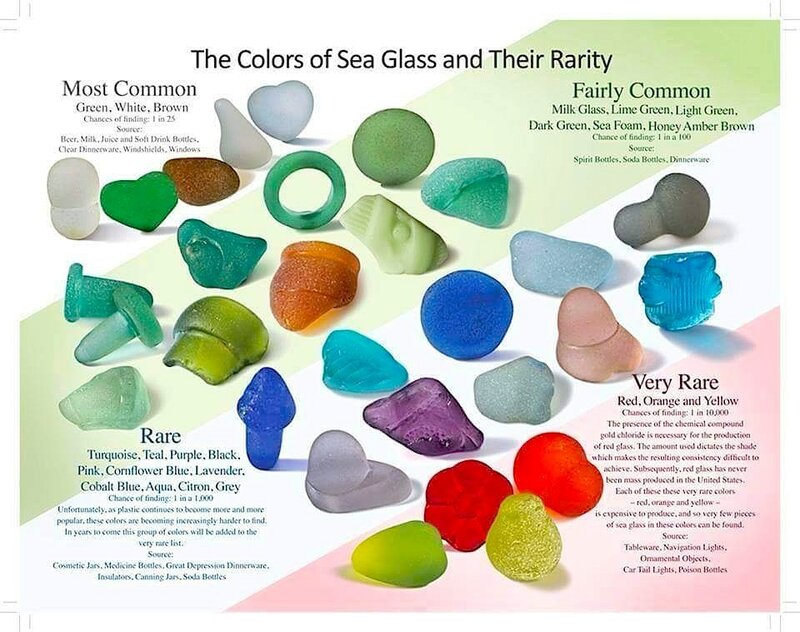 Use the chart below to help your understanding of the various types of sea glass rarity. 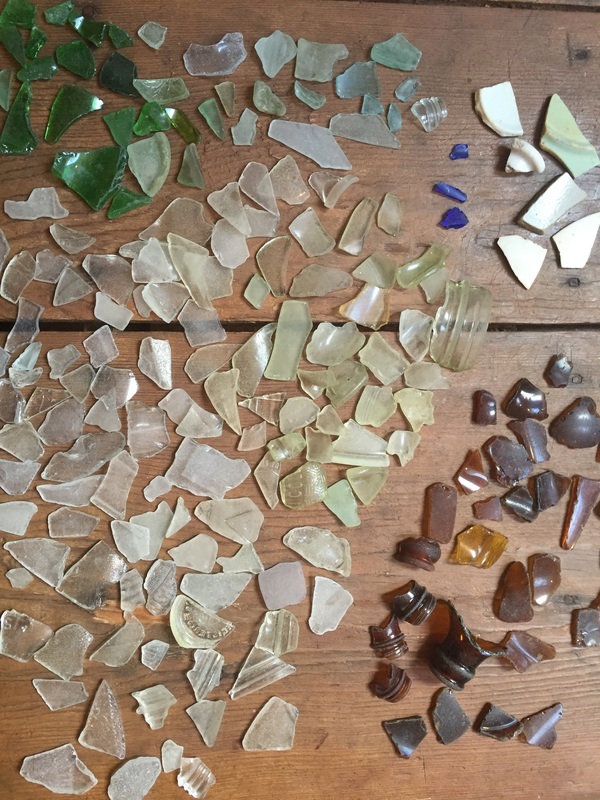 After several visits to North Beach and also Glass Beach in Port Townsend the sea glass hunter will begin to tire of picking up the white and brown pieces that are most prevalently found. 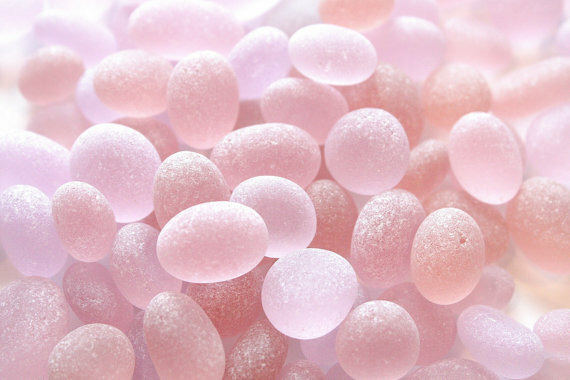 The real hunt will be for the rarer colors such as sea foam, aqua, pink, yellow and even red. After spending almost a year of regular visits to these two beaches my focus has become the acquisition these rarer colors and most importantly a few sea glass marbles! Marbles were historically placed inside of paint cans to help with the mixing of the paint. As the paint cans were thrown out with the trash and pitched over the bluff their eventual disintegration would leave only the marbles to be tumbled on the beach and in the surf. Many were also thrown out with the trash as they were lost by their childhood users. 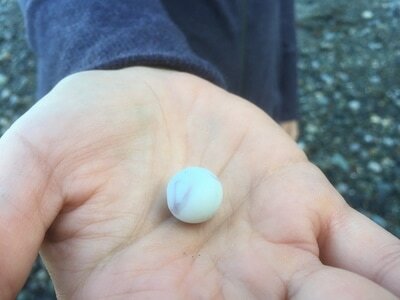 So... over my year of searching I have found around five precious marbles! A few are of the swirl style with different colors of swirl embedded in the white glass. On one guided tour I gave a few months ago one young man named Kanon found a clear purple marble with great excitement. 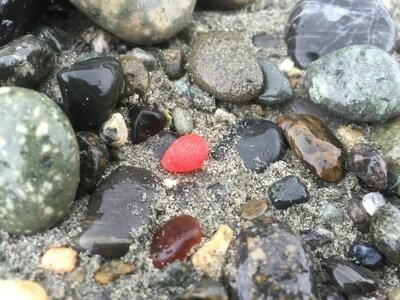 Below you will see a collection of photos of rare color finds and some of the marbles found over the last few months. The following sea glass photos were taken during and after my trip up to Port Townsend and out on North Beach. The pieces were pebble size with only a few measuring even one inch. 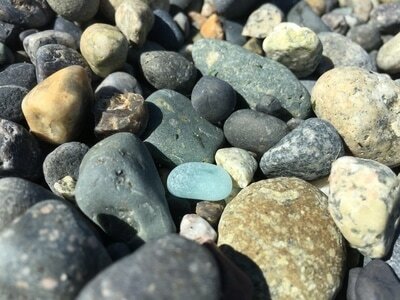 I found that most of the gravel beds one mile out to the west had small pebbles of sea glass. A little digging with a garden trowel and many tiny shards of sea glass appeared. This may be enticing but with a little patience a sea glass hunter will find a greater concentration of sea glass at McCurdy Point and beyond on Glass Beach. The hike is breath taking (literally) but the sacrifice will pay off once you've parked yourself on a gravel bed on Glass Beach and begin pulling out gems every few seconds. 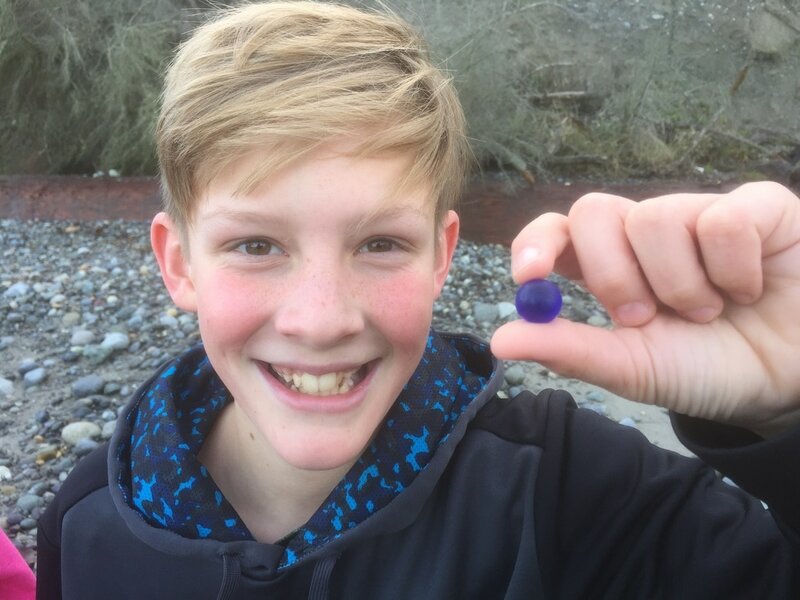 The following video uploaded to youtube will provide great tips and information a sea glass hunter will need if you want to hike out to Glass beach beyond McCurdy Point in the Port Townsend area. 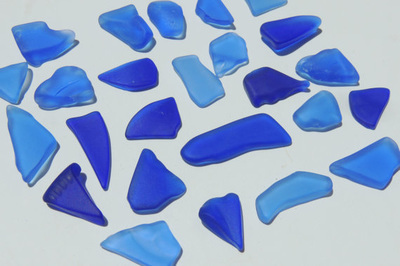 This is truly the best beach to find top quality sea glass in larger concentrations. 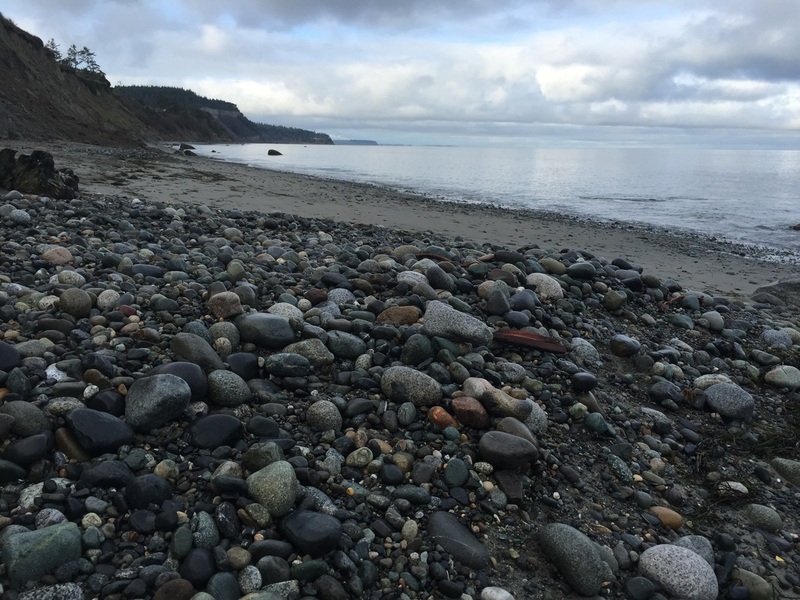 The picture below illustrates the typical rock bed along North Beach that holds many pieces of sea glass. A little concentrated digging throughout a bed like this would yield small and medium sized sea glass pebbles. It may be time consuming but will yield a handful of tiny treasures. 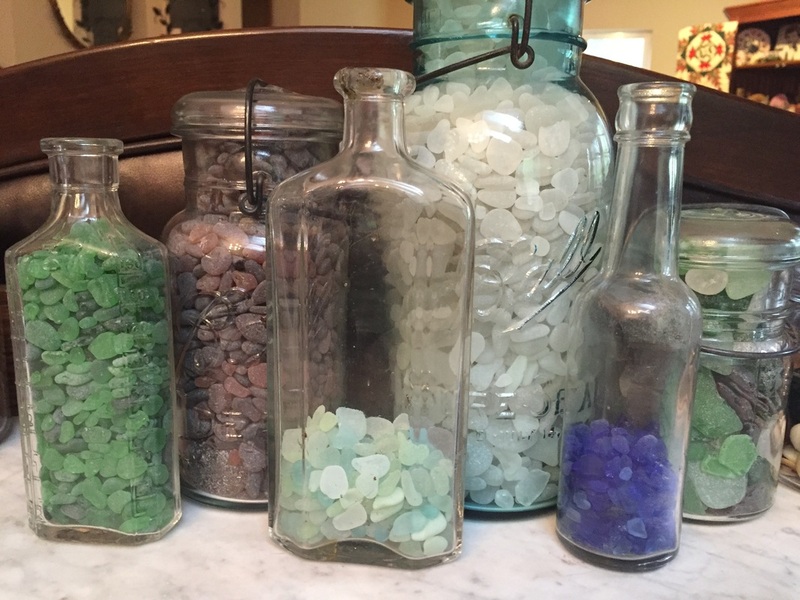 A growing sea glass collection! 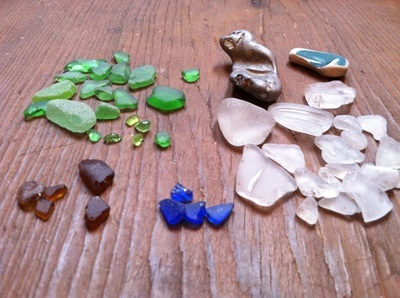 Almost every piece came from North Beach and Glass Beach in Port Townsend, WA.